Phoenix Online Publishing and Cuve Games have teamed up to bring you Heroes & Legends: Conquerors of Kolhar, for PC, Mac and Linux on August 21st. 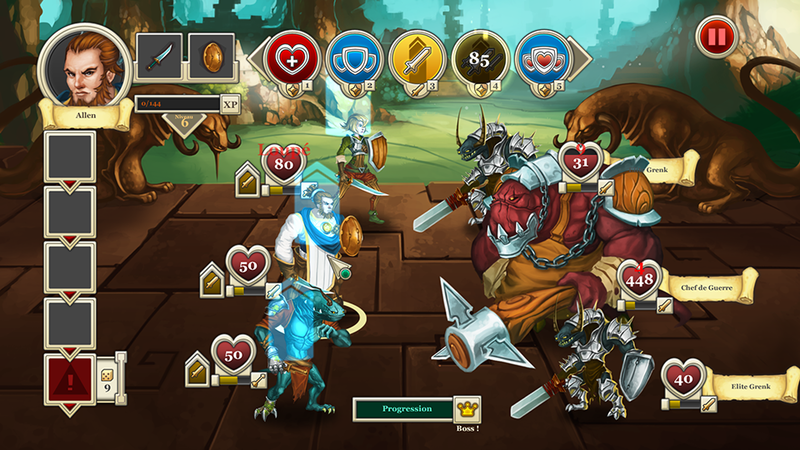 Heroes & Legends mixes a variety of gameplay elements from popular genres such as RPGs, Strategy and Roguelikes, and creates an exciting and frantic game revolving around automated combat. Outfit your party of five powerful heroes with custom-made weapons and armor built using a full-fledged crafting system, then lead them into battle against legions of lethal foes. As you defeat foes your characters will earn experience, eventually leveling up, and you will also gather important loot including new weapons and armor as well as invaluable boosts from items such as health potions and level-up scrolls. You can also explore the map for randomized events which may aid or hinder the party’s quest. With over 100 monster types to defeat, Heroes & Legend’s features a quick and engaging combat system that is easy to learn and fun to master. With the mix of RPG and Roguelike mechanics fans of both genres will find themselves enthralled with its simple charm and strategic difficulty. Heroes & Legends will be available for PC, Max and Linux on August 21.